MELBOURNE, Australia, February 4, 2015 (ENS) – The Sea Shepherd Conservation Society says one of its ships has chased an illegal toothfish-poaching vessel out of its hunting grounds in Australia’s Exclusive Economic Zone onto the high seas of the Southern Ocean. Two poaching vessels, Kunlun and Yongding, were intercepted by the Sea Shepherd ship Sam Simon on Monday, just 50 nautical miles from Australia’s Mawson Base in Antarctica with prohibited fishing gear on their decks. Sam Simon Captain Sid Chakravarty said today he has successfully defended his ship against numerous aggressive intimidating actions of the Interpol-wanted poaching vessel, Kunlun, while in “hot pursuit” of the vessel through drift ice. “In an attempt to hide their illegal operations and deter us from our pursuit, the poachers first made a dangerous attempt to flee through thick drift ice. When that failed, they tried to intimidate us, making multiple, intentional approaches to my vessel which resulted in dangerous, near collision situations,” said Captain Chakravarty. The Kunlun and the Sam Simon are now headed north, approximately 2,500 nautical miles southwest of Australia. The incident was the second such attack on the Sam Simon in as many days. On Monday, the poaching vessel, Yongding, turned aggressively towards the Sam Simon, crossing within 10 metres of the conservation ship, narrowly avoiding a collision. The Yongding eventually split from the chase and was last seen by the Sam Simon heading east. 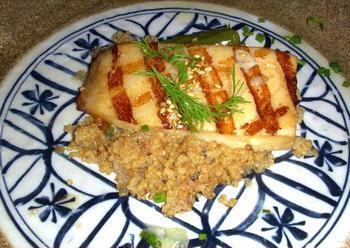 The poachers are after Patagonian and Antarctic toothfish, usually marketed as Chilean sea bass. These slow-growing fish fetch premium prices in markets and restaurants for their rich, oily flesh. 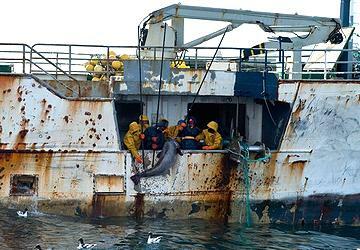 “Australia’s Antarctic Territory is under attack from these poachers. We have maintained our pursuit of the Kunlun, and will not let them engage in any further illegal fishing activity. However, thanks to the mute response from the Australian government, who maintain an embarrassing silence in the face of this invasion in Australian waters, one more poaching vessel is now on the loose in the Southern Ocean,” said Chakravarty. The region is managed by Australia in accordance with its international obligations as a Member of the Commission for the Conservation of Antarctic Marine Living Resources (CCAMLR). Both the Yongding and the Kunlun have Interpol Purple Notices issued for them, and are on the CCAMLR black list of Illegal, Unregulated, Unreported (IUU) fishing boats. Both vessels were flying the Equatorial Guinea flag at the time they were located by the Sea Shepherd. The Yongding and the Kunlun, along with another poaching vessel, the Songhua, are believed by Interpol to have links to a known Spanish crime syndicate. On January 13, following a request from the New Zealand government, all three poaching vessels were issued with Interpol Purple Notices for suspected illegal fishing activity and related crimes. The New Zealand Navy was unsuccessful in its attempt to board the Yongding and the Kunlun after they were discovered operating illegally in the Southern Ocean last month. The New Zealand ship HMNZS Wellington had to return to port to refuel. Between January 6 and 13, the New Zealanders spotted the Yongding, the Kunlun and the Songhua hauling gill nets laden with toothfish in a CCAMLR regulated area, where such fishing methods are prohibited. The three vessels, which were sighted travelling together in December 2014, “have all changed their names, national registration and other identifying characteristics on multiple occasions to try and avoid detection,” interpol said, announcing the Purple Notices on January 13. Both the Yongding, which has operated under at least 11 different names and nine flags since 2001, and the Kunlun, which has been spotted using at least 10 different names and five flags since 2006, are allegedly owned by Stanley Management Inc., thought to be a shell company based out of Panama, according to the Interpol statement. “New Zealand is committed to doing its part to protect the Southern Ocean and we will continue to work with international partners to take every possible action to deter illegal fishing and prosecute those responsible,” said New Zealand’s Foreign Minister Murray McCully, announcing the decision to request the Interpol Purple Notices. Australia has not responded to the presence of the poaching vessels in Australian waters; now Sea Shepherd is prodding the Australian government to act. “The inaction of the Australian government, choosing to not take up the chase after the HMNZS Wellington was forced to return to port, has allowed the poachers to roam free in these waters. 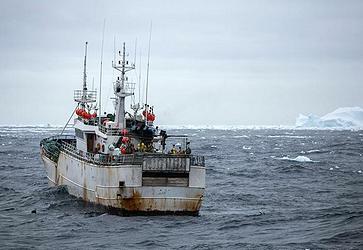 This has directly resulted in the illegal vessels continuing to plunder Antarctica of its vulnerable toothfish populations,” said Chakravarty. Chakravarty said Sea Shepherd plans to stop the illegal fishing by using the Sam Simon as a blockading tool, putting the conservation vessel behind the poaching vessels when they run their fishing gear out. “The Sam Simon is now committed to blockading the fishing operations of the Yongding and the Kunlun, with the Sea Shepherd once again standing as the last line of defence for the marine life of Antarctica,” he said. The Australian Greens Spokesperson for Fisheries, Senator Peter Whish-Wilson, says that New Zealand’s efforts to use its Navy to round up illegal toothfish poachers in the Southern Ocean shows how pitiful the Australian government’s efforts have been. “The Australian government is frozen with inaction as these illegal activities are carried out under their nose,” said Whish-Wilson. “The Liberals had promised to send the ACV Ocean Protector, our A$150 million dollar, purpose built, Southern Ocean patrol boat, to protect our fisheries. It was part of the Coalition’s fisheries election policy document,” he said. But that vessel is being decommissioned and ADV Ocean Shield has replaced it. 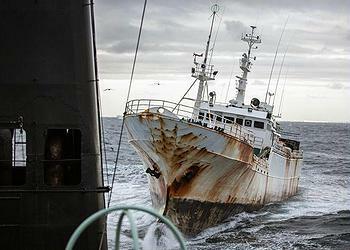 “Illegal, Unreported and Unregulated fishing in the Southern Ocean is a major issue. Not only does it impact on fisheries, but it finances organized crime gangs,” said Whish-Wilson. The Yongding and the Kunlun are two of six remaining outlaw vessels, which Sea Shepherd calls the “Bandit 6”, that are known to be involved in IUU fishing of toothfish inside the CCAMLR region in the Southern Ocean. On January 16, the Sam Simon completed an operation to retrieve illegal gillnets from the Southern Ocean, after they were abandoned by another of the “Bandit 6” poaching vessels, the Nigerian-flagged Thunder. More than 70 kilometers (45 miles) of illegal gillnet was retrieved over a three-week period and over 1,400 fish were returned to the ocean. Fellow Sea Shepherd ship, the Bob Barker, is currently engaged in a record-breaking pursuit of the Thunder, which today entered its 47th day. The outlaw poaching vessels are the focus of Sea Shepherd’s current Southern Ocean Defence Campaign, Operation Icefish, which began last December. Operation Icefish is Sea Shepherd’s 11th Southern Ocean Defence Campaign and the first to target toothfish poachers in Antarctic waters. The other campaigns have targeted the Japanese whaling fleet. The Japanese said that this year they would only count, not kill, whales in the Southern Ocean after the International Court of Justice ruled in March 2014 that Japan’s lethal “research” whaling program is illegal. Chakravarty has said that Sea Shepherd ships will keep an eye on Japan’s minke-whale surveillance to make sure Japanese whalers are not actually killing any of the animals this year.